CyberGhost boasts a whopping 30 million userbase. Just how did it get there? CyberGhost was founded in 2011 in Bucharest, Romania, and grew to 30 million users by 2019. We’re here to review their product, and find out why the company grew so fast. Due to its location outside of any surveillance conglomerates, along with its intuitive UI, it’s certainly one of the more interesting VPN services available. Plus CyberGhost is one of the rare VPN providers who actually frequently update their product. In this review, we share our delights in using this nifty VPN service. 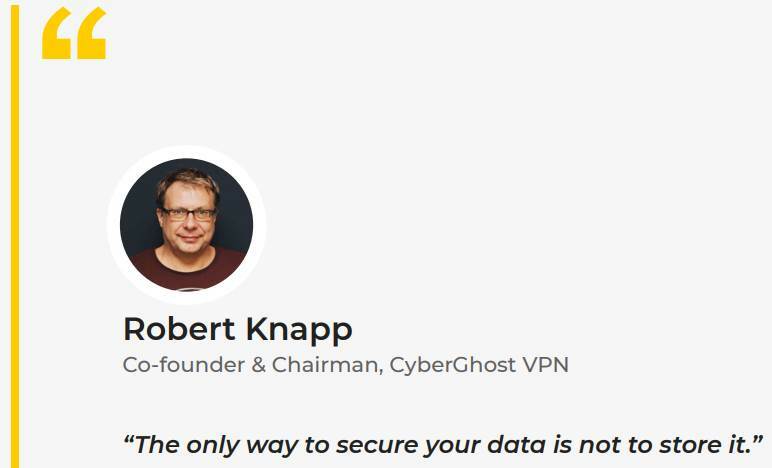 CyberGhost has been one of the VPN companies that push for transparency. It has been for some years now; since 2011 CyberGhost has been publishing a Transparency Report. They claimed to be the first ones in the industry to publish such reports and we didn’t manage to find evidence to combat this claim. If you know of another company that did this before CyberGhost, please let us know! The management has collectively decided that it’s best to practice the Privacy by Design principle. The Transparency Report unveils some really interesting figures. In 2018, they received 27,747 DMCA complaints and 37 police requests. Imagine how many people were protected under these figures – a DMCA complaint to a VPN provider can affect more than one person. As of writing, CyberGhost’s VPN service boasts a respectable 2,836 servers. We’ve certainly seen more, but we’ve also seen a lot less. CyberGhost hosts their servers in multiple locations globally spread across 60 countries. This comes as a surprise for a VPN that comparably goes for a low price. It’s clear CyberGhost are proud of their server count, with figures being plastered all over their website and on their app. The website lists all their locations and the number of active servers in each location. This feature is very useful for users, as CyberGhost effectively categorizes and segregates servers depending on certain attributes. They separate crowded servers from empty ones, while also highlighting the fastest – handy and useful. 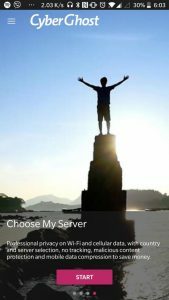 This leaves users with the freedom to choose their server, and fully customize their connection according to their needs. Not only does their list segregate servers by traffic; they also indicate which servers allow for peer-to-peer file sharing and torrenting which removes the guesswork for the user. As for reliability, CyberGhost provides a very stable connection. During our review, we didn’t experience any connection drops – a great sign that they maintain their servers well. Netflix Test: Netflix and chill away, VPN-seekers! One of the things that we really look for in a good VPN is the ability to access geo-restricted shows on Netflix. Thankfully, CyberGhost delivers. It’s not just the ability to get around restrictions. It’s their entire product user interface that makes this process painless. 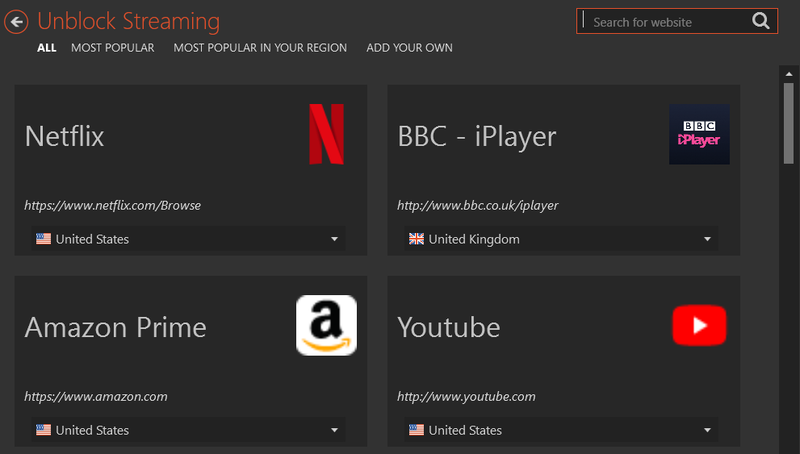 Their main menu allows you to specifically “unblock streaming” and this brings you to a selection of streaming websites that are known to have geo-restrictions (e.g. Netflix, BBC iPlayer, Amazon Prime). Clicking on any of the options connects you to an appropriate VPN server that allows access to these websites. This useful feature spares the user from trying out multiple servers before getting one to work – a painful process seasoned VPN users know all too well. CyberGhost has consistently proven to be successful in accessing these websites. This is a great point in CyberGhost’s favor, considering these popular streaming services are notorious for blocking out VPN IP addresses. CyberGhost is so successful at accessing Netflix, due to the fact they have dedicated servers for getting around Netflix’s restrictions. The servers constantly change IP addresses whenever Netflix starts blocking them out. Smart! Another contributing factor to CyberGhost’s capability to access Netflix is their value for user feedback. Users are asked whether a server is successful in accessing geo-restricted shows as one of their metrics for filtering their servers and IP addresses. This superior function is also what got CyberGhost on our top 5 best VPNs for Netflix list. Most VPN providers tend to veer away from being openly able to torrent on their servers due to the bad rap associated with torrents, CyberGhost boldly claims that their VPN service allows for this by having a “Torrent Anonymously” option right at the home menu. Torrenting and peer-to-peer file sharing will prove not to be a difficult task for CyberGhost users; despite the throttled speeds, they make torrenting through a VPN easy for their users. CyberGhost hosts a few servers that are designated for torrenting and P2P file sharing and automatically assigns you to a server once you select the “Torrent Anonymously” option. 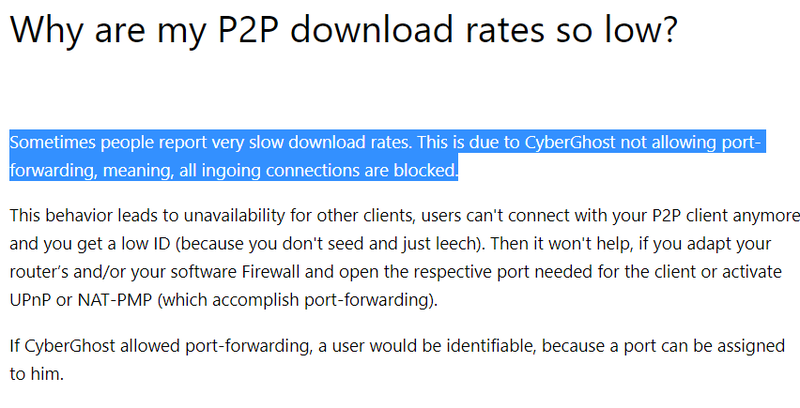 On the CyberGhost website, they have included their reason for the throttled P2P download speeds on their FAQs section. Despite not having the fastest download speeds, we still think that the way CyberGhost has set up dedicated torrenting servers is a huge plus for the service, and for users taking advantage of it. The groundwork has been laid; they just have to follow through by improving their speeds. If you don’t want to worry about speeds for filesharing, here are some other VPNs that are great for torrenting. When it comes to value for money, CyberGhost offers a great plan that goes for as low as $2.75 per month, a remarkable price for a feature-rich VPN with a great server count such as this. There’s a bit of a catch to the dirt-cheap price though; you’re locked in with CyberGhost’s service for a total of 3 years. Yes, that’s a long time to commit to a service, especially if you’re looking for something temporary. This might come as a turnoff for those who can’t commit to a subscription that spans that long; CyberGhost’s 1-year plans are priced at $4.99 per month which while still reasonable, could be too pricey for some – especially when we consider the download speeds that they offer. A 3-day free trial is available for download, should you wish to see if CyberGhost is the right VPN for you. On top of all that, CyberGhost annual plans come with a bonus 1-year McAfee subscription, if that interests you. Overall, we’re not huge fans of such a binding long-term contract, but at such a reasonable price, it’s hard to argue against – especially if you’re looking for something to see you through the next 3 years of Netflix, torrenting, and anonymous browsing! It’s quite comforting to know that CyberGhost offers a 30-day money-back guarantee, something that’s significantly longer than the more common 7-day window most VPN providers give to their subscribers. Another great thing about their refund policy is that there are no questions asked, as stated on the refund policy on their website. We look for such policies (no one enjoys struggling to retrieve their hard-earned money), so it’s nice to see CyberGhost making refunds a painless process. You can purchase your subscription via credit cards (American Express, Visa, MasterCard), PayPal and BitPay. Unfortunately, CyberGhost does not offer any discounts for those who pay with Bitcoin, but that’s not much of a drawback. We’re simply pleased to see such a great payment offering. 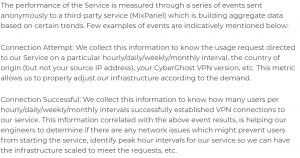 CyberGhost’s subscription allows for up to 7 devices connected simultaneously on one subscription; this places them strongly above other VPN providers, who typically limit users to 5 or less. CyberGhost’s UI is equally appealing, with a minimal and pleasing aesthetic. The brightly colored menu is as about as straightforward as it gets. The menu showcases all the VPN offers, while making sure that you can access the most important features of CyberGhost with as little as 1 click. Hovering your mouse over the selections gives you a nice overview of each section, making it very user-friendly and easy for VPN newcomers. CyberGhost is available for Windows, Mac OS, iOS, Android, the standard software offering nowadays for VPN providers. Apart from the basic platforms, CyberGhost works with Linux, routers, and others. Setup guides are available on their website. 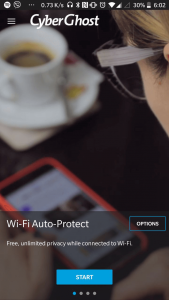 Upon opening the CyberGhost app on Android, the user is greeted with a rather intuitive 1-click solution for Wi-Fi auto-protection. Likewise, it gives the user an option to choose which servers to connect to. The Android app also features an option for secured streaming which allows the user to access geo-restricted streaming programs on their mobile devices. Customer Support: Oh hello, there! That didn’t take long! 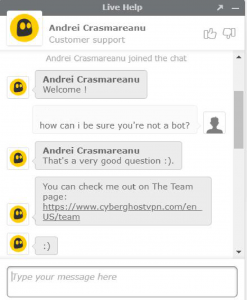 We had a great experience with CyberGhost’s support. They offer a 24/7 Live Chat on their website and the initial response time to our request for help took less than a minute. We didn’t have any issue for the rep to solve, but it’s pleasing to see such rapid responses. The in-app support and feedback tabs were also very useful, great for those looking to find their own answers. 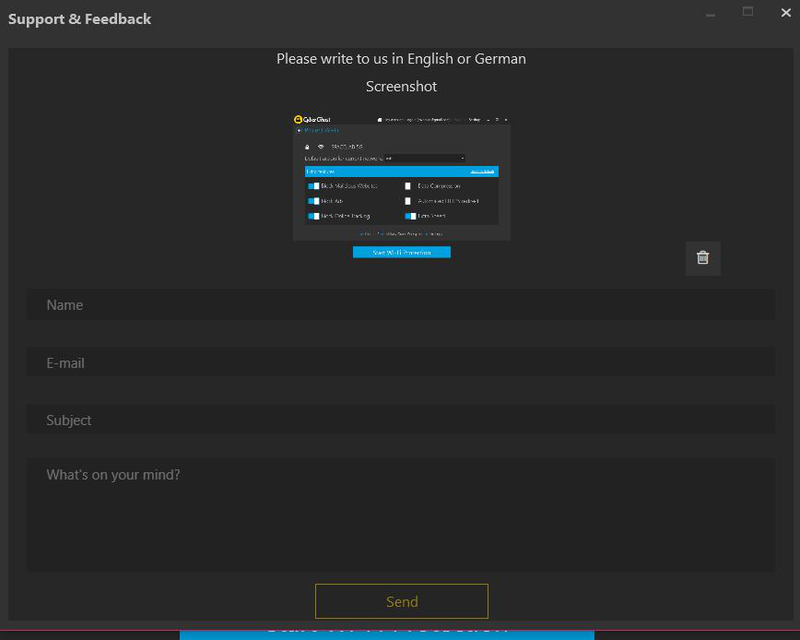 Clicking the support button automatically takes a screenshot of the last menu that you have visited which can spare the user the hassle of doing so. This is automatically attached to a ticket that you can file to their customer support to address. CyberGhost has some promising privacy claims. Naturally, we decided to test if they were indeed true. CyberGhost boldly claims that they have a strict no-log policy. While connection attempts and connection success may seem like harmless statistics, this still causes some hesitation. Despite our doubts with how strict they are with their no logs policy, we still think that CyberGhost values user security. It’s up to each user to trust CyberGhost, and take their word for it, since there’s no way of truly knowing. CyberGhost installs an industry standard 256-Bit AES encryption which is to-date considered uncrackable by brute force methods. CyberGhost also offers multiple encryption protocols, such as OpenVPN, L2TP-IPsec and PPTP. Most recommend using OpenVPN, due to its open-source nature. CyberGhost passed the DNS and IP leak protection, one of the first things consumers are concerned with when it comes to VPNs. In 2018 we tested our speeds from East Asia. Unfortunately, CyberGhost seems to fall somewhat short in maintaining good speeds for users in Asia. Perhaps some digital nomads can relate to our test results. Latency – The farther you are from a server, the slower your latency gets, and this remains true for CyberGhost. We got ping speeds ranging from 68ms up to 314ms; unless you use the VPN for fast-paced gaming, these speeds are still considered within normal limits. Downloads – When it comes to web browsing and streaming videos in 1080p, CyberGhost still performed well on a decent connection. But for downloading larger files and streaming in higher resolutions; our tests showed up to almost 80% loss in speeds which severely hindered our browsing experience. Uploads – Uploading files and sending data through CyberGhost VPN should not be much of a worry as speed loss isn’t quite as significant as the loss of speeds when downloading files. CyberGhost is one of the top VPNs that we can’t complain about. If you think you have a legitimate complaint, please share with us! CyberGhost SA was founded in 2011 in Bucharest, Romania. The CEO is Robert Knapp. In 2017, it was sold to the Crossrider Group for $9.8 million. According to their website, they currently serve over 30 million users. Their team includes 70 IT professionals in Romania and Germany, support team in the Phillippines and advertising team in Israel. Like we mentioned before, the company is one of the most transparent in the VPN industry with annual Transparency Reports. 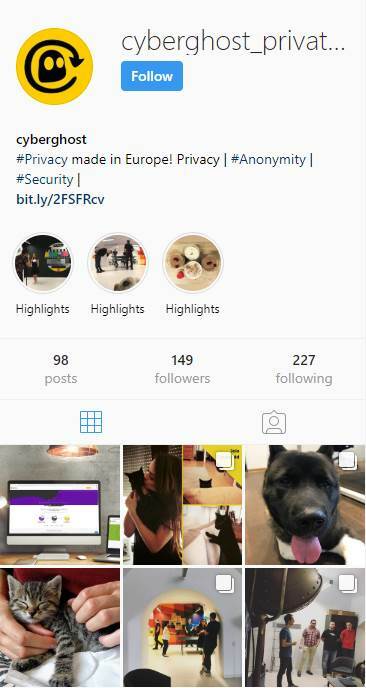 And of course, they follow the latest trend in transparency – social media to show that the people behind the product are in a harmonious relationship with animals. This is a controversial issue for many CyberGhost users since its deal with Crossrider in 2017. Although Cyberghost is based in Romania, a nation that doesn’t fall under the 14 Eyes Alliance, as a London-based group, Crossrider is subject to the 14 Eyes Alliance. This has the potential to impact users who care about their privacy. It’s unclear how much CyberGhost and Crossrider will work together on this point. CyberGhost VPN Conclusion: Yes, we recommend CyberGhost VPN! Overall, CyberGhost is a strong performing VPN. It’s an absolute breeze to use. The product is intuitive enough even for the most technologically inept to understand (sorry mom). The configurable settings are enough for more advanced users to play around with and make use of. It’s one of the best VPNs in terms of company transparency – they’ve been doing a Transparency Report since 2011! Its performance for such a low subscription price; CyberGhost is a VPN that will shine, given you take the 3 year plunge. We recommend CyberGhost for those users seeking for their first long-lasting VPN.